Did you know that cooking at home can not only be enjoyable, but relaxing and therapeutic too? So much so that it’s been clinically proven to leave us feeling less stressed and happier in our everyday lives. How fortuitous therefore that Baldassare Amodio, brilliant chef at Novikov’s Italian Restaurant, is back with a whole new series of the venue’s perennially popular masterclasses? Helping us sort our wheat from our chaff, and a great deal more besides, these latest tutorials commence on 30th March with a focus on vegetarian dishes. Whilst many Italians would baulk at the idea of removing meat or fish from their diets, Baldassare positively embraces the challenge with a gorgeous repast that includes the likes of protein-paced Quinoa Salad, Aubergine Parmigiana, Sicilian Caponata and Oven Baked Stuffed Vegetables. If you have trouble telling your bigoli from your fedelini, then the fresh pasta masterclass on 27th April is for you. Italy might be home to thousands of types of pasta, but there’s nothing quite the silky texture and rich flavour of the fresh stuff. 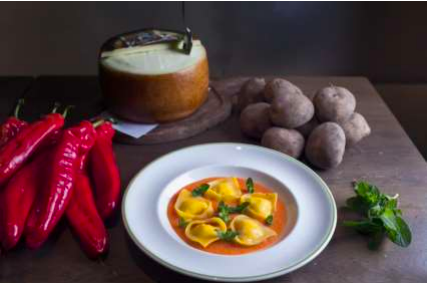 Join Baldassare and his team as they highlight some of the most celebrated, from Tortelli with Potato, Mint & Pecorino Cheese with Red Peppers Passata (pictured above) to Orecchiette with Turnip Top & Anchovies. Forget the diet on 25th May and instead embrace a true Italian speciality as the pastry masterclass answers the prayers of those with a sweet tooth by spotlighting classics such as Tiramisu, Panna Cotta, Lemon Tart and Doughnuts. Finally on 22nd June the spotlight falls on one of the world’s rarest and most valuable ingredients in the Summer Truffle Masterclass. These little balls of decadence take centre stage in incarnations such as Fresh Tagliatelle with Truffle and Ricotta & Truffle Ravioli. Looking slightly further ahead and dates for your diary include a return to the glorious Suffolk countryside, or to be precise the grounds of Novikov’s unique kitchen garden project at Brent Eleigh Hall, for an al fresco tutorial, followed by autumn masterclasses that take in everything from pizza through to fish and meat. Whilst such education is pretty much priceless, each masterclass is just £95 per head to include breakfast, tuition and an informal lunch featuring the dishes cooked that morning, all paired with wine chosen by Novikov’s sommelier. What’s more guests who only join for lunch will need to part with a mere £35 per head.